After Jeep CJ models were available until 1986 which includes popular Jeep CJ5 CJ7 CJ8. Starting in 1987 Jeep introduced the Jeep Wranglers models starting with the YJ (1987-1995), then came the TJ (1997-2006) and finally Jeep JK (2007-2018). We do know "CJ" in Jeep CJ models stands for "Civilian Jeep". So what does jk mean in Jeep Wrangler "JK". Short answer it doesn't really stands for anything. Just like the Wrangler YJ and TJ models JK is also simply internal engineering code, not an abbreviations for initials. Sorry for the disappointment. Since you already read this far, lets give you basic over view of JK Models. 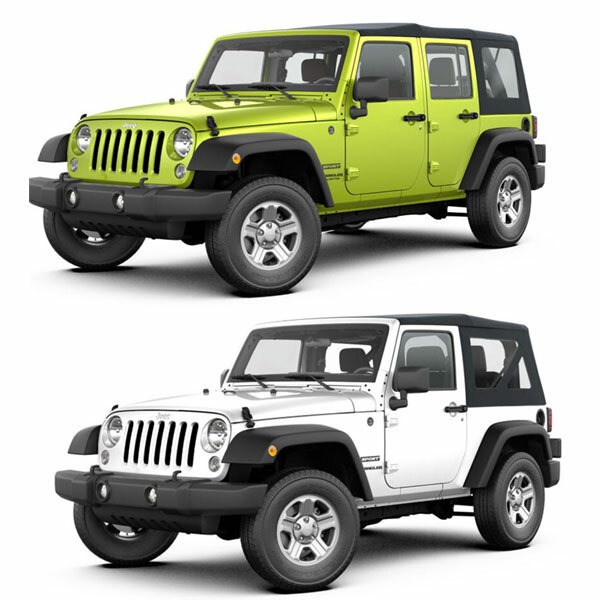 Jeep Wrangler JK models are availabe in short-wheelbase 2-doors and long-wheelbase Unlimited 4-doors. As mentioned above JK models were introduced in 2007 and were available for purchased either 2 or 4 doors model. Previous Wrangler models like the TJ were only available with 2 doors option. So if you see a 4 door Wrangler out on the road your guess is correct that is one of the 2007-2018 JK model with 4 doors. Full description on 4 Door JK model is Jeep Wrangler JK Unlimited. If you are shopping around for Wrangler at a local dealership and you tell your sales person you are looking for 4 doors Wrangler; he will be showing you the "Unlimited" model. Just like most vehicles JK body is stamped with different names like Unlimited, Polar Edition, Willys, but at the end still be a JK. If you try to order a part for a Polar Edition, it’s almost impossible, but try and get a part for a JK, and you’re going to see a lot of great products. Jeep Wrangler JK 2 door model can easliy be confused with Wrangler TJ model. To help identify a JK, the grille is slightly slanted back with a rake, with the bottom sticking out more than the top. Say Goodbye to JK Models: Production for extremely popular Wrangler JK models ended on April 27th, 2018. After 12 successful years of production JK models were replaced by 2018 Jeep Wrangler JL. If you are in the market for Jeep Wrangler JK Accessories be sure to checkout our Jeep JK parts selection. This entry was posted in Jeep Wrangler JK (07-18). Bookmark the permalink.